InCompany Apps provides a possibility to extend your InCompany use of desktops and laptops with mobile phones and tablets. So to share and update InCompany information you are not restricted to your office but are able to connect to your company information anywhere in the world. InCompany Apps can store the data local on your mobile so your work is not lost when the connection is lost. 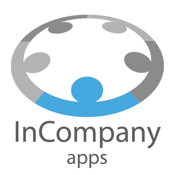 InCompany Apps can connect to your sharepoint website data. You can even build your own navigational menu to present the sharepoint website pages anyway you want.